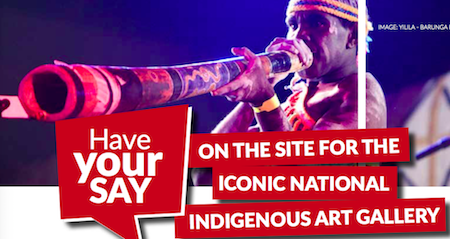 More than 60% of respondents did not vote for Anzac Oval – the Chief Minister’s choice – in a government online poll about the location of the proposed National Indigenous Art Gallery. Minister for Tourism and Culture, Lauren Moss, disclosed the previously confidential figures yesterday: 39.1% of people voted for Anzac Hill, 32.2% voted for “other” and 28.7% voted for Desert Park. There were 649 responses to the poll started in November. Minister Moss says in a media release: “The two most suitable potential options for the gallery [the Anzac Hill Precinct and Desert Park] and a third choice of ‘other’ were put out to the community for comment. “While many sites were looked at, these two sites were considered the best options based on factors including size, sense of place, connection to the landscape and accessibility, taking into account heritage and cultural considerations,” says Ms Moss. The release did not disclose how this conclusion was reached, nor how it was determined that “the Anzac Hill Precinct was the only option that met the selection criteria suitable for a world-class facility in the CBD”. Ms Moss says the responses for “other” saw people suggest a range of mostly CBD sites. I took a drive to Desert Park last week and noted it took six minutes from the Gap. Driving in to the car park I marvelled at the view to the ramparts of the West Mack’s at every twist and turn. So much space, world class backdrop, no flood risk, infrastructure in place and complimentary to Desert Park itself. It’s a no brainer! So why is the Gunner mob hell bent on sticking the gallery in the afternoon shadow of Anzac Hill? Seems to me there is a whale in the bay and promises have already been made to who knows whom.